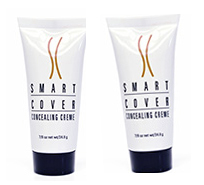 Smart Cover Cosmetics - Smart Cover Works in Seconds to hide even the worst Varicose Veins and Age Spots! Smart Cover Works in Seconds to hide even the worst Varicose Veins and Age Spots! to hide even the worst Varicose Veins and Age Spots! With Summer here, Smart Cover's natural looking, water-proof Concealers hide Varicose Veins, Spider Veins, Bruises, Age Spots and other body flaws instantly! Comes in six shades to match most skin tones and it’s so easy to use! For a Limited Time, Smart Cover Cosmetics is offering a Buy One, Get One Free Leg Cover in your favorite shade. Get two tubes for the price of one by clicking here. (Limit 2 free tubes per customer).